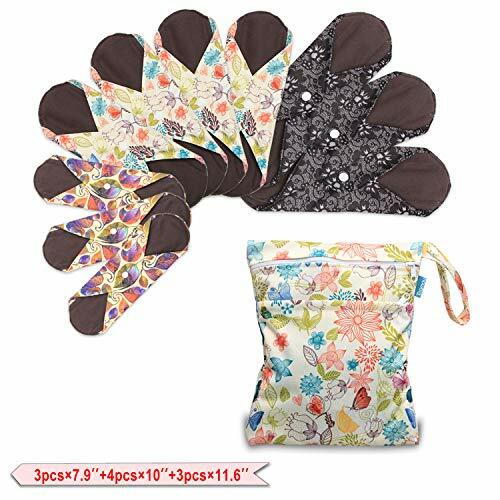 If you’re looking to make the switch from disposable feminine hygiene products to reusable ones, you’ll want to strongly consider cloth pads, like these Teamoy Reusable Cloth Menstrual Pads. They’re great for your health, as well as the environment, and they’ll also save you lots of money over the medium to long-term. Teamoy Reusable Cloth Menstrual Pads are a great choice if you want to make the switch. They are affordable, come with a wet bag, and are made in a nice range of size and colour options. Over on Amazon, they have plenty of great reviews and satisfied customers. The negative reviews are mostly about these cloth pads shifting around during exercise. But, this is a common complaint about most cloth sanitary napkins, and not just specifically about these ones from Teamoy. Temoy Reusable Sanitary Pads aren’t readily available in stores. Amazon has very reasonable prices, a full selection of the all the size and colour options, and shipping is often free with Amazon Prime. Why Consider Switching to Reusable Sanitary Pads? Disposable pads are expensive! This is particularly true if you have a heavy period, long, or irregular one. Most people spend between $5-10 a month on disposable feminine hygiene products. Cloth pads do cost more money up-front. However, over the long-term, you can save a lot of money by making the switch. In general, you’ll recoup your up-front costs in just a few months. Disposable pads are made in large part from plastic that isn’t biodegradable. That means that this stuff will still be hanging around the landfill in hundreds of years from now. Compare this to cloth menstrual pads that are made mostly from natural materials like bamboo, charcoal, or cotton fabric. You can use them for 5-10 years, and when you do throw them out, they’ll biodegrade in a short time. Disposable pads contain trace amounts of toxic chemicals. They come from the manufacturing process (bleaching in particular is bad), as well as from the pesticides used to grow the cotton. Compare this to cloth pads. After you wash them, you’ll have a toxic chemical free period experience. Or, you may want to opt for organic cloth menstrual pads instead. Comes with a matching wet bag, to store soiled pads in when not at home. The two compartments allow you to store fresh, and soiled pads in it. The small size is more like a cloth pantyliner, while the large size is like an overnight cloth pad. If you want to maximize your savings, environmental benefits, and be healthier (and happier!) during your period, you’ll also want to switch to a menstrual cup from tampons. Unlike tampons which are disposable, menstrual cups can be used for 5-10 years. Instead of absorbing menstrual fluid, they collect it. Then, every 12 hours or so, you have to empty your period cup and then reinsert it. Like pads, menstrual cups do cost a bit more money up-front. However, you’ll recoup your costs in only a few months, and then you’ll have years of savings to come. Have a heavy period? If yes, then you’ll especially want to consider a menstrual cup. Jumbo tampons have a capacity of around 10 ml. Average cups can hold 30 ml (the Diva Cup for example), while high-capacity menstrual cups can hold up to 40 ml. That’s 4x less period hassle! There are lots of menstrual cups on Amazon. 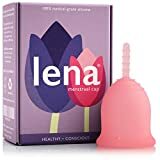 However, one of our favourites is the Lena Cup. It’s made in the USA from top-quality, medical grade silicone. It’s affordable, well-designed and has one of the highest user ratings in the category over on Amazon. Before you buy them, you may want to know how difficult (or easy!) it is to care for cloth menstrual pads. If you don’t care about staining, then just remove the soiled ones, and throw them into your laundry hamper. Be careful to not let them stain other clothes if they’re still wet. Besides that, just launder as normal. If you are worried about staining, get dark pads! Or, if you do get lighter pads, then just soak them in some cold water with a bit of laundry soap for a couple hours after wearing them. Wash as normal after that in cold water. Most companies recommend hanging dry, instead of using the drier. Overall, most people who tried the Teamoy Reusable Cloth Menstrual Pads were pretty happy with them. They are well made, absorbent and are comfortable to wear. If you’re looking for a reusable alternative to your disposable menstrual pads, then these ones from Teomoy make a nice choice, and they are certainly better than many of the other options on a place like Amazon. However, if you plan to use them for any kind of sports or working out, perhaps reconsider! 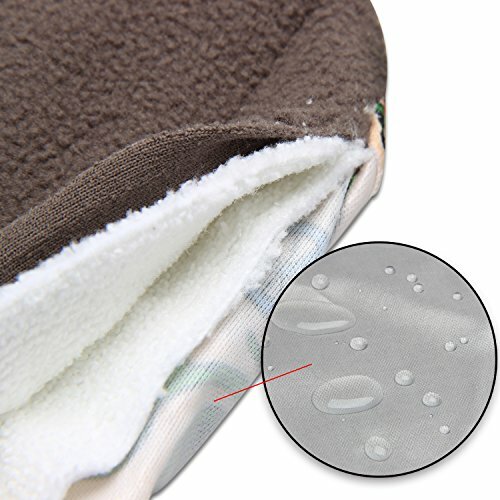 Most of the negative reviews on Amazon were related to these cloth pads shifting around during activity. Please note: this is a common complaint amongst cloth menstrual pads and not necessarily a flaw of this specific product. We generally recommend keeping a box of disposable sanitary napkins in your bathroom cupboard for working out. Otherwise, go with cloth pads for your everyday usage. It’s a nice solution to a common problem with cloth pads! What about Organic Reusable Pads? If you’re looking to reduce your exposure to toxic chemicals during your period, you may consider organic cloth pads. Although they’re a bit more expensive, the higher price is worth it to some people. What about Teamoy pads? Unfortunately they’re not organic, which is a reason you may not buy them. However, wash them first before use, and then you’ll have a toxic chemical free period experience for the remainder of the years. 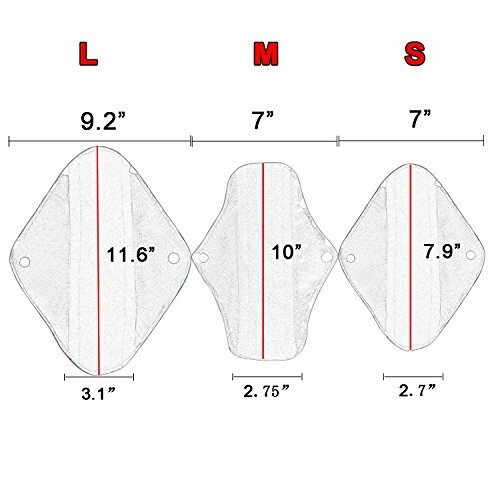 Teamoy Cloth Pads: Have your Say! What are your thoughts about Teamoy Reusable cloth pads? Are they a buy, or are you considering another brand of washable pads. « Saalt Cup vs Diva Cup: Which One is Best for You?